CHINA: China has been pounded by more summer rain, forcing the evacuation of more than 55,000 people, state media said late Tuesday, warning of further downpours. 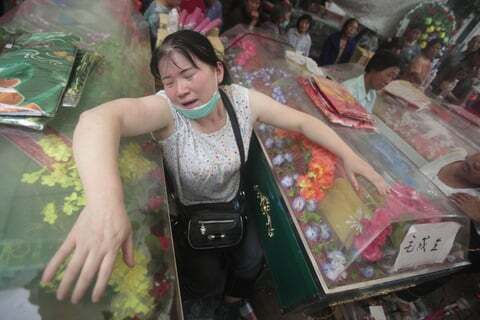 A Chinese woman grieves during a mass funeral for victims of the floods in Linxiang, in central China’s Hunan province. Most of the evacuations were in the city of Xianning in the central province of Hubei, as water levels in the city rose to two metres. China said on Monday the number of people confirmed dead in more than a week of floods and landslides triggered by the torrential rains had leapt past 100. Some of the hardest-hit areas have only recently been through a severe dry spell, but the relentless rains are forecast to last until today (June 17). The two provinces were among the worst hit by a severe drought in recent months that devastated millions of hectares of farmland in central and southern China along the middle and lower reaches of the Yangtze river. In eastern Jiangxi province, 1,200 people remain stranded by floods after heavy rain fell on the northern part of the province last Thursday. China is hit by heavy summer rain every year. In 2010, downpours across large swathes triggered the nation’s worst floods in a decade, leaving more than 4,300 people dead or missing.